WWE TLC: Tables, Ladders and Chairs from Baltimore, Maryland wrapped up the 2011 pay-per-view calendar last night. Unfortunately, last week’s Raw did very little to put the event over instead showcasing WWE’s annual Slammy Awards. The result was more of recap for the past year leaving TLC to stand on its own. It’s a shame since TLC was a solid pay-per-view among this year’s offerings. Raw with the Slammys was a show that would have been far more appropriate after the event and closer to the end of the year. Looking back on last week in more detail, I think we’re both looking forward to the start of 2012, getting on the official “Road to WrestleMania XXVIII,” and January’s Royal Rumble. All of that begins tonight in Philadelphia, Pennsylvania. PTB: For a show leading into a pay-pre-view, last Monday’s Raw was particularly weak, particularly when TLC looked to be a solid show. The best match of the night was the fatal four-way featuring Cody Rhodes, Dolph Ziggler, Zach Ryder and Daniel Bryan, but even with that match there wasn’t a lot to entice you to buy last night’s show. Instead last week was all about the annual Slammy Awards and it followed an award show format. I know I’m not looking for that on Monday nights and I’m curious about your opinion on incorporating them into Raw like they did last week. I don’t think I’d watch them otherwise and I really didn’t watch here. Brian: I wouldn’t watch them at all. I have no interest in them because there is really no reason to have them. It doesn’t help any storylines along and it certainly takes time away from the product. Brian: Using them as a year-end wrap up show would make way more sense. PTB: The show opened with Booker T and Hornswaggle. Is he any easier for you to tolerate since “gaining” the ability to speak from Santa Claus? Is there a joke here about Booker losing his ability to speak? Brain: I still dislike Hornswoggle. He’s taking up a roster spot for someone that can actually wrestle. PTB: I’m not sure what the long term plan behind bringing Booker T back in to action is, but if it was going somewhere I half expected him to defeat Cody Rhodes last night. I didn’t mind the award bit, but it led into an entire commentator battle that just took up way too much time. Brian: Don’t get me started about Michael Cole and Jim Ross. If WWE is focused on ratings, why would you start off the show with something that is completely unwatchable? PTB: I couldn’t agree more. It gave me the impression that the “extra” 8-9PM hour wasn’t important to the show’s producers, but the segment with Mick Foley and Ted DiBiase confirmed it. Wade Barrett versus The Big Show was the first match of the night and didn’t start until more than thirty minutes into the show. I’ll admit, I really like Foley being back in WWE, but just about everything he’s done on Raw to date was been lackluster even if his admitting that it’s terrible is a funny part of the angle. Brian: Totally agree. I thought his presence would be great, but he’s really come up short. PTB: A fair number of returning SuperStars appeared last week as Slammy presenters and “The Road Dogg” Jesse James was probably the most unexpected. His appearance may have been better coming closer to the top of the show, particularly with all the attempts at rhyming. The same could be said for Lita even if it was part of another fairly empty Divas segments that did very little to set up Beth Phoenix versus Kelly Kelly at last night’s event. Santino Marella and the Bellas may have been the best award presentation of the night leading into a big return for Triple H before his sledgehammer / ladder match with Kevin Nash at TLC. I just wish we had more to talk about from the night beyond these silly awards. Brian: That was the best Slammy segment of the night, partly because of the Bellas and partly because Santino was so good. Why would you bring HHH back in such a lackluster way? Have him come out and confront Nash. Another thing that rubbed me the wrong way was HHH’s comment about Undertaker. Why are you looking past the current PPV and setting up a possible WrestleMania match? PTB: In some ways, the Triple H / Nash was the match I was most interested in seeing just to see whether they could pull off anything remotely satisfying. John Cena made a strong showing calling out the Rock in his award segment last week and I’m glad to hear him continuing to point out Rocky’s absence week after week. It teased a heel turn a little more for him even though I still don’t see it happening. Brian: I LOVE the fact that he keeps pointing that out. I can’t believe more people don’t feel swerved by the Rock’s non-presence. PTB: I didn’t really consider this until after things went down last night, but John Cena was not featured on the pay-per-view in any way. It’s difficult to remember the last time that was the case and it makes the path he’s taking even more intriguing to me as we really start to build toward WrestleMania XXVIII. I was happy to see C.M. Punk hold onto the WWE Championship last night. The injury angle from last Monday and having the odds stacked against him is fun, but I’m more interested in seeing him work through individual feuds and one-on-one matches. His continuing to take shots at John Laurinaits is a lot of fun, but really it just led to more video clips on a night that had more than its fair share. Brian: I actually enjoyed the video package more than any other that night. I didn’t remember the Dynamic Dudes, so it was cool to see that. It truly have you a glimpse of how bad Laurinaitis was as a wrestler. PTB: Punk did have a match to help set up his match at TLC, but it was essentially the same line up with Randy Orton thrown in. That’s just not inspired booking even if Punk’s injury at the hands of The Miz and Alberto Del Rio puts his championship in more jeopardy last night. Brian: As for uninspired booking, I’m starting to get used to it. PTB: The biggest news from last week’s Raw was the return of Kane. I’m not sure if he was after Cena or if he just got between Kane and Mark Henry. Either way, I was hoping it would have some bearing on TLC, but like so much of last week’s show it seemed like another wasted opportunity for interesting developments. 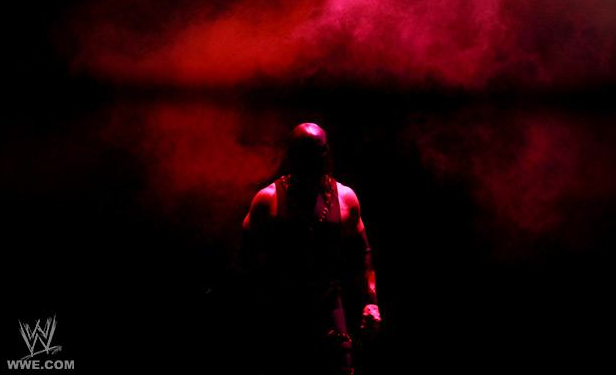 Brian: If you watched the teaser clip for Kane earlier in the night, it totally ruined his return. It shows him putting the mask back on and at the end of the clip a video of John Cena is shown and then glass breaks. I think it was pretty clear what his intentions were. I’m totally disappointed in the re-masking of Kane. It makes zero sense. PTB: We got another video teasing the “return” of someone on January 2nd and I think I prefer the videos interrupting the show to using YouTube. Any new theories after hearing about this “she” that will be the harbinger of the returning SuperStar or seeing the word “Control.” on the screen as the video closed? Brian: This weeks video actually confused me more than it helped me figure out who it will be. PTB: The most exciting news coming out of TLC last night is Daniel Bryan cashing in his “Money in the Bank” contract and defeating the Big Show after he made quick work of the injured Mark Henry. A feud between Bryan and Big Show could be amazing given the performances the Show has turned in lately. It’s kind of amazing to have both C.M. Punk and Bryan as reigning champions. Other highlights included Zach Ryder finally getting a US title win over Dolph Ziggler. The feud played out nicely, and while I’d like to see it continue a bit longer I can’t imagine Ziggler isn’t bound for a main event run after strong matches with Punk and Orton on Raw in recent weeks. Unfortunately, TLC had some lowlights as well. It was a forgone conclusion that Orton would defeat Barrett at TLC even though I had hoped otherwise. Unfortunately, his prominence has fallen off since his Nexus days, so I’d like to see their rivalry continue since it really elevates Barrett and I’m a fan. There were also two bonus matches with the return of Air Boom against Primo and Epico and Sheamus versus Jack Swagger, but with no build up it’s hard to care about those matches which is a shame since the faces involved have some momentum right now. Although far worse than that was the failure of last week’s Raw to properly promote the pay-per-view. Also, how does Snookie beat the Muppets as A-Lister of the year? Below is a complete set of results from last night’s WWE TLC: Tables, Ladders and Chairs 2011. All photos courtesy of WWE.com.